Artists and Curator in Conversation: Image and Exploring the Eruv. What are the ways that art explore social phenomena? Analytical tool? Protest soapbox? Screed or critique? How does a curator make use of art for this same exploration? 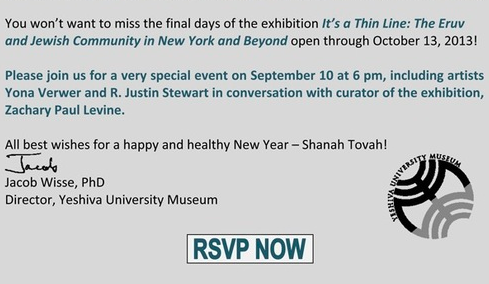 Join curator Zachary Paul Levine in a tour/discussion with artists Yona Verwer and R. Justin Stewart as they reflect on the artists’ installations in "It’s a Thin Line: The Eruv and Jewish Community in New York and Beyond". September 10th, 6pm at Yeshiva University Museum 15 West 16th Street (between 5th and 6th Aves). Trains # 4,5,6,Q,R,L to Union Sq., #1,2,3,F to 14 Street.